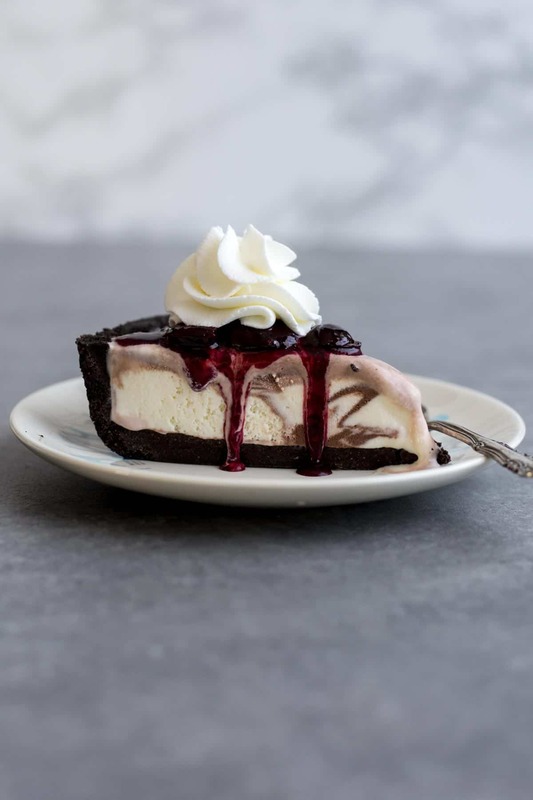 This No Bake Ice Cream Pie with Cherry Compote will quickly become one of your favorite summer desserts. It’s easy to put together with store-bought ice cream, yet is still a homemade-enough-dessert that you can brag about. I know you’ve had plenty of ice cream cakes, but have you ever had ice cream pie?? 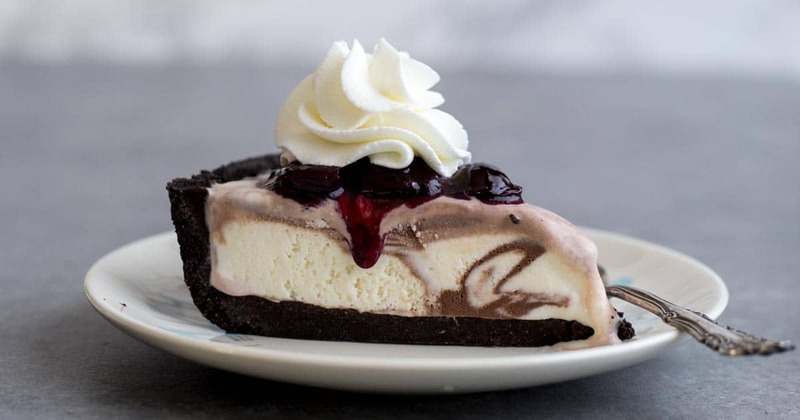 Well, this No Bake Ice Cream Pie with Cherry Compote is a must try. 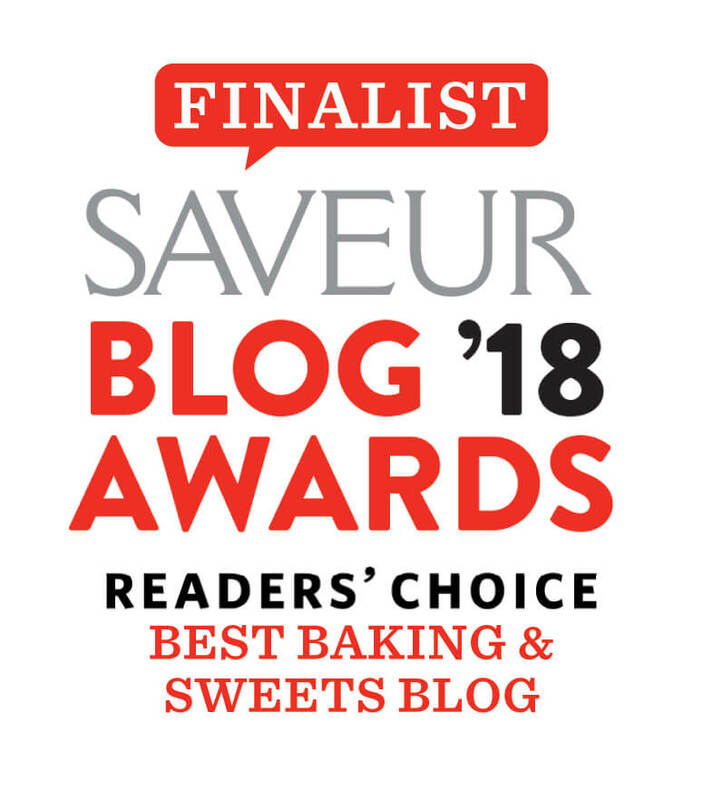 It’s so easy to put together and I can guarantee it will become one of your favorite easy summer desserts. 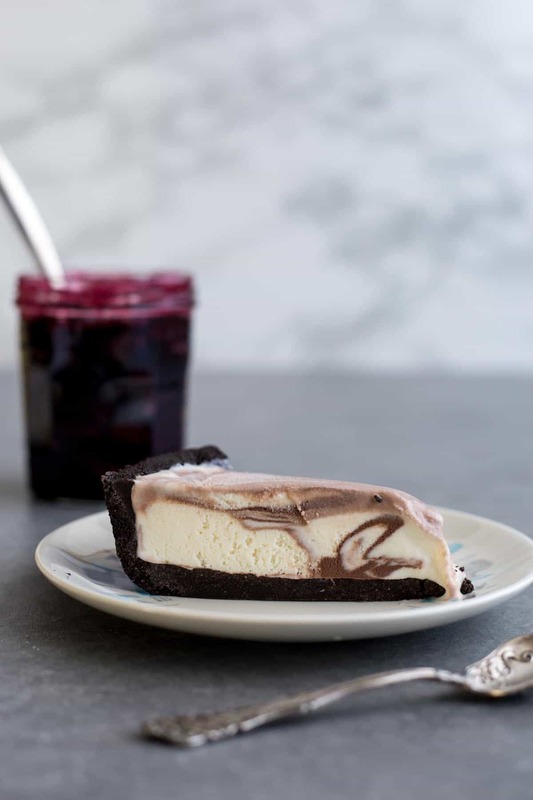 This No Bake Ice Cream Pie with Cherry Compote is a cheat recipe for me because I made this Oreo cookies pie crust just a few days ago. Cherries are spilling out of my fridge right now so cherry compote is always just ten minutes away. And you can pretty much find whipped cream hiding in a fridge corner at my house at all time. 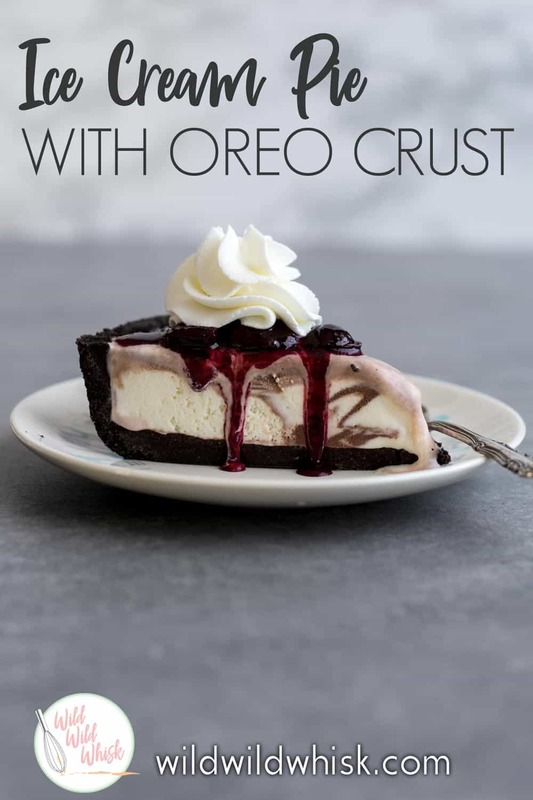 So all I needed was some creamy vanilla and chocolate swirl ice cream to fill the crust with. The recipe at the end of this post has the complete ingredient list with directions to take you from start to finish. 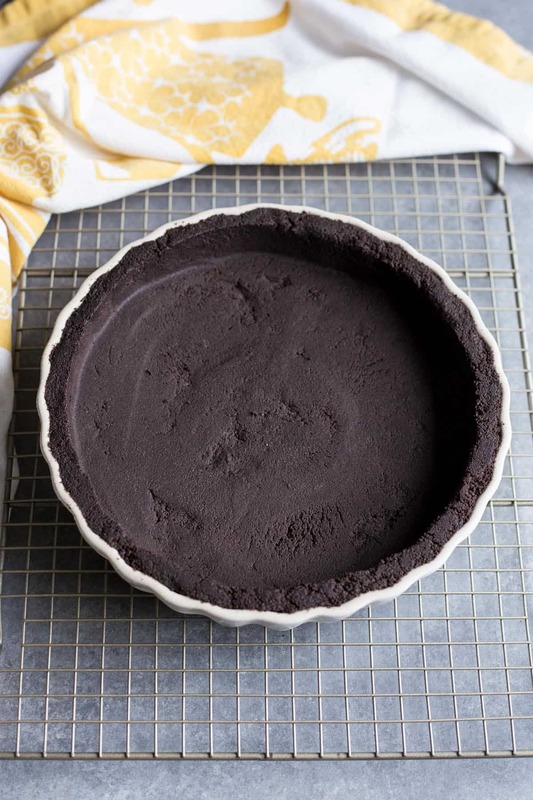 But be sure to check out my Oreo Cookies Pie Crust post from earlier this week for step by step photos of how to make this pie crust. I used Alden’s vanilla and chocolate swirl ice cream from Sprout’s. It’s so creamy and is quickly becoming one of my favorites. Let it soften at room temperature for a few minutes, it doesn’t take long because this ice cream freezes soft. Scoop it out and fill the pie crust. Then level it with an offset spatula. Freeze it again before slicing and serving. 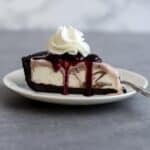 I find cherry compote to be the perfect garnish for this ice cream pie with a dollop of homemade whipped cream. Though you can explore other compote to your liking, perhaps this strawberry compote. Add the compote and whipped cream just before you serve so you don’t have to freeze the pie with all the toppings on it. Wrap well and freeze until hardened before filling. Add cherries, sugar and orange juice in a medium sauce pan and cook over medium heat for 5 to 6 minutes until cherries are wilted and soft. Remove cherries with a slotted spoon and cook the liquid for 2 - 3 more minutes until reduced in half and thickened. Add cherries back into the pot and stir to combined. Let cool and stir in the almond extract (optional). 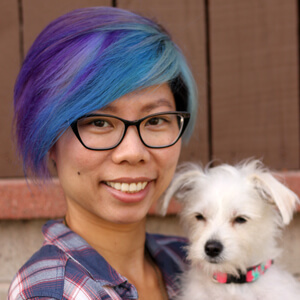 Stream in the extract of your choice and continue to beat until stiff peak forms. When the pie crust is ready, allow the ice cream to soften slightly at room temperature for ease of scooping and spreading. Scoop out the ice cream and fill the crust to the rim, use an offset spatula to spread it evenly. Freeze the pie until the ice cream is set again before slicing and serving. Cut into slices, top with cherry compote and whipped cream just before serving. My favorite part is actually the cherry compote, it goes so well with the chocolaty flavor.